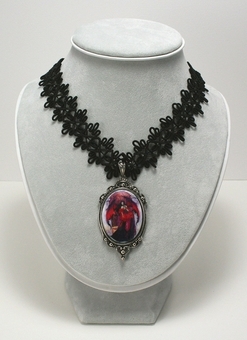 With this Beautiful Vanities Vintage Cameo Necklace by Amy Brown, you can show off your own unique fairy style with a lace choker necklace. The beautiful lace is custom created to perfectly match the image. 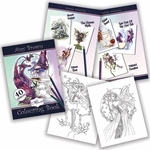 This is a great gift for yourself or any fairy lover! 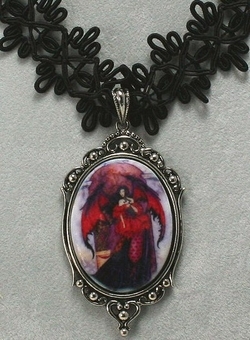 This stunning choker features a fairy with dragon wings, which gracefully curve around her. She is clad in an outfit of bright red and black, and her scarlet-tipped wings match. Size: The cameos are porcelain and measure approximately 2 1/2" long. The choker is adjustable from 12” to 14" long.